Not back to health, just back. The kids have appointments today, so we will see how they all are health wise. Thanks for all the healing wishes. I didn’t expect anyone to miss us. I appreciate all the warm thoughts and comments. To all you “crazies” who said to put Vapor Rub on their feet with socks-THANK YOU! It actually worked! I thought you all sounded a little nutty-but where were you last week through 5 sleepless nights of endless persistent coughing? Thank goodness you all told me about that. I was desperate and would have tried anything. It actually worked. I couldn’t believe till I saw it for myself. Well I did TRY to get creative yesterday, after the kids made their Valentines Day cards, but it just wasn’t working. I can’t create when I’m sick. I love this image from Leere Aldrich-Party Girl. She looks like she is having quite the celebration! I think she’d make a great image for a big birthday-or surprise party. I had to pair her with some new PP I got at Michaels from Making Memories. I was really excited to find some new paper that I really liked. The argyle pattern just suits this image so well. I decided I would add lots of sparkle to her (sadly not picked up in my photo :C), and her dress bow, is 3D. The flowers are Sprite Prima’s that I layered to match. 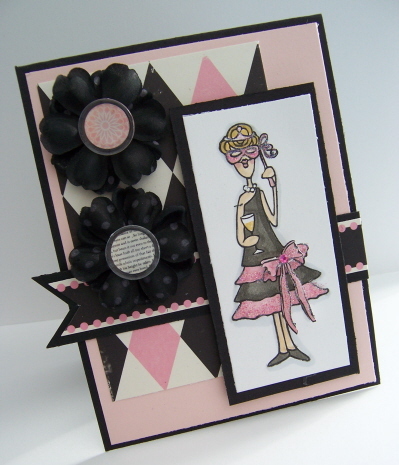 I think Pink & Black are so elegant. She was fun to color. I love the Champagne! I added some clear gel pen on it to look like glass. Just a fun party card. I decided to make another card using the same colors/paper pack, since I had fun with this one. This cute little poodle image is from Sentiments A.
I think its adorable all on its own! I love using smaller images as a focus. I drew on my lines of my handbag. Just a quick doodle for more interest. I little pearl in the bag center. I inked only the accessorize word in the sentiment stamp since I didn’t need it, in its entirety. I like being able to have that versatility, and given that the stamps are clear made is easy! OK Not too much more to say since I’m tired and heading out to the doctors with the kids-but at least I got something posted for you! !